What if you found out that the whole purpose of life was just to ENJOY it? On Monday we did a talk at the Electric - Soho House - in London all about 'How to stay happy and grounded in a fast-paced life'. It's a HUGE topic that we dedicated a whole podcast to recently - listen to it here. And ever since we did the talk I've been thinking back to a blog post that I wrote six years ago that served as a powerful wake up call at a time when I was running a million miles an hour, taking on waaaay too much and living off a constantly caffeinated and adrenalised high, while underneath it all I was exhausted and unhappy. The blog post was my way of grabbing myself by the shoulders, gently shaking me with love and saying 'Why are you doing this to yourself?!'. Why was I pushing myself so hard? Noone was asking me to do that, so why did I feel that I should? Who was I doing it all for? Was I expecting to get some kind of prize at the end of it all? Finally as I lay one night collapsed on my sofa, in full blown burn out, I scribbled out this blog post and drew this little postcard. It marked a turning point for me and I've never forgotten the message I gave myself that day. So if you have a tendency to push yourself too hard, take on too much, put other people's needs ahead of your own and forget to prioritise the things in life that make you truly happy, then have a read of this. This message is for you too. "Imagine if, when you die, it turns out that there IS a heaven and a pair of pearly gates. And when you get there, standing there is god himself looking down at you. You're in the spot light. You're waiting for the big judgement, the ultimate test, hoping desperately that you did OK, that you did enough, that you were good enough, helped enough people, weren't too selfish, weren't too mean. 'Because that's all we wanted. For you to enjoy your time on earth, enjoy the experience of being alive, discover what made you come alive, what made you happy and spend your life doing that...that was what it was all about'. Imagine after all that striving and hard work, it turns out that the best thing you could possibly have done for yourself, the people around you and the earth as a whole, was to discover what makes you come alive, follow your heart and spend your time on earth doing that. Imagine that. I like this game. Try it. Day dream the scene for a moment (no requirement to believe in god for this to work), the moment where you are told that the whole point of this game called life was to create and live a life you love because THAT above all is what the world needs. What would your reaction be? Play it out. Here's how my scene pans out. I'd stand for a moment agog. And then I wouldn't be able to hold back. "Seriously?! Was that all I had to do?! Why didn't anyone tell me!? Why did I listen to all those people saying that I should be doing this and that?! Why didn't you send some kind of message?!" I think god would probably look back agog at me. "What do you mean I didn't tell you?!" I imagine god saying back somewhat indignantly, if gods are allowed to be indignant. "You had that fridge magnet up for twenty years saying 'don't ask what the world needs, ask what makes you come alive and then go and do that, because what the world needs is people that have come alive', you built a whole career around that message. So you did know"
If heaven had rocks, I'd be kicking them by now. "Yeah, but I wasn't sure if that was really allowed - enjoying life so much, having such a good time. Why didn't you just tell everyone it was allowed and that we ALL had a choice and it wasn't just that I was 'lucky' but it was simply that I chose to make it happen. You could have helped me out"
I imagine myself bursting into hot tears of frustration. Thinking back to all those hours, days, years spent doing what I thought I 'should' rather than what made me happy, what made me feel alive. All those years standing in my own way, all that time feeling guilty for having a life I loved, trying to make up for it, apologising for it, feeling guilty for it. I'd want to go back in time and show myself this scene, send it to myself like a picture on a postcard. I'd tell myself to stop feeling guilty about having a life I love, but instead to celebrate it and enjoy it. To get comfortable with it, embrace it, relax into it. That this is allowed. That everyone has the choice to create a life out of the stuff they love and that just because not everyone chooses to do that doesn't mean you have to feel guilty about doing it yourself. Don't create a life you love and then not allow yourself to enjoy it. THAT is bonkers. I'd say do even more of it. Have even more adventures. Dance, laugh, paint, love out loud. And celebrate the whole lot of it. The glorious experience of being alive and being you. I'd tell myself to join hands with all the others out there creating lives out of the stuff they love and celebrating it. I'd tell myself to full on party with them, keep that party expanding and the door open to anyone that wants to join, but not to worry if people don't choose to. Let them be. So my question to you today is...what would you do? What if we were to find out that that IS what we're here to do - to enjoy life, really experience it, follow our hearts, do what makes us come alive? What if you were told that your job on this earth was to make YOU happy, discovering and doing the things you love? Click reply to let me know." And so, six years later, let's get this conversation going again. Let us know, by leaving a comment below, what you would do differently if your whole purpose on earth was simply to ENJOY yourself and all that life has to offer. And let this be the start, like it was for me six years ago, that you begin to make YOU a top priority in your life. I am so excited for you to listen into today’s podcast, because this week I got to interview the wonderful Tiu de Haan - a celebrant, writer and full-time inspiration when it comes to weaving ritual simply, but powerfully, into your life. We first came across Tiu a few months back when we watched her TED Talk ‘Why ritual is still important’. I was so inspired and moved by what she was saying that I tracked her down and sent her an email saying ‘you’re amazing, can I interview you for Project Love pleeeeease? !’ and a few weeks later we were sitting in her flat in north London getting deep into conversation. I loved every minute of it and found that the more you hear Tiu talking about ritual and the power of it, the more you realise how important it is for all of us to get ritual back into our lives. So download it here and as you walk to work, cook your dinner or get ready for bed, hit play, have a listen in and then come back here and let us know what you thought. P.S. For more Tiu wisdom and love, check out her TED Talk 'Why we still need ritual', her posts on ritual for Huff Post (she is a wonderful writer with a book on its way) and of course her website. We practiced self love for 28 days straight, along with nearly 1,000 other ladies all over the world (from London to Tel Aviv and Argentina to Arizona) as part of our campaign '28 Days of Love' (which launchd on Valentines Day this year) . When it comes to self-love we can all too easily fall into the trap of thinking that it is about feeling happy and positive twenty four seven. That that is somehow the goal. To never have a bad day and always have a smile on your face. But being positive and happy 100% of the time is unrealistic and not at all what self-love is about. Try being happy and only ever having positive thoughts and feelings and you will suffocate yourself. Self-love is not about being happy all the time. It’s about being real - tweet it! So when you’re having an off day and feeling crappy, the self-love way is not to try and run from it or cover it up (that will actually just make it worse). The self-love way is to lean into it, sit with whatever you’re feeling. Embrace it. Welcome it in. Because as you embrace and honour how you’re feeling, you embrace and honour you. As you lean fully into how you are feeling, you lean more fully into you. And that is what self-love is all about: accepting yourself fully, exactly as you are and exactly as you are feeling, in any given moment. But even more than that, really feeling your feelings gives you power. Because when you listen in to your feelings, without judging them or running from them, and instead ask 'Where is this coming from? What can I learn?' you will find that these feelings can act as powerful guides - showing you where you need to change something - either in your life or in your attitude. Or where you simply need to practice more self-love. Using your negative feelings in this way is a key tool in creating and living a wholehearted life. It's also incredibly liberating. There is something deliciously rebellious about being allowed to sulk in the name of self-love. Keep repeating it, gently, over and over and feel the weight of it lifting as you start to fully embrace how you're feeling without resisting it, judging it or making yourself feel bad for feeling it. Step 2: What is triggering these feelings? When you’ve got comfortable with how you’re feeling and have fully allowed yourself to be with it, then you can explore where these feelings are coming from, what they are showing you and what you can do about it. It might help to write things down as you do this. Here are some questions you can use to help yourself identify why you are feeling like this, what has triggered this feeling and what you can do about it. · Where is this all coming from? · Did something specific happen that made you feel this way? · Is there an area of your life that just isn’t making you happy? · Has someone hurt or upset you with something they have said or done (whether they meant to or not)? · Are you the one making yourself unhappy with unrealistic expectations, by being too harsh on yourself, piling on pressure, comparing yourself to others, criticising yourself? · Are there things out of your control that are upsetting you? Step 3: What can you do about it? Once you’ve identified where these feelings are coming from, ask yourself what can you do about it? How can you deal with this situation in a positive and loving way? · Is it time to bring about a change in your life, big or small? What can you do to get that started? · Is there something missing from your life that you need to bring into it, like creativity, a daily spiritual practice or exercise? What can you do to get that into your life starting this week? · Has someone hurt you and you need to have a conversation with them? How can you approach it with love and compassion? · Have you been hurting yourself by being too harsh on yourself, comparing yourself to others or putting unrealistic expectations on yourself? If so, how can you make it up to yourself? What messages of love, support and forgiveness can you offer yourself right now? · Do you need to simply surrender and accept that there are things right now that you cannot change? In which case what can you do to give yourself the love, nourishment and support you need, as you go through this challenging time? Once you have come up with a positive step you can take, all is left is to go and do it. It is a simple practice but so powerful and as you get more into it you will find that you start to actually value your funky days and those negative emotions and will stop seeing them so much as 'negative' and you'll start seeing them more as feelings that are here to guide you. So give it a go next time you are feeling sad, upset or angry and let us know how it goes! In 3 years of helping women get ready for love and make love last, we’ve found that success and confidence in love usually boils down to one thing: Self-love. But while most of us know that self love is important, the challenge is knowing HOW the hell to actually do it! So to celebrate the day of lurrrrve, we’ve compiled 50 ways that you can start flexing that self-muscle and make Valentine's Day all about YOU. Because you are really really awesome. Evening without phones, laptops, ipads, TV - anything with a screen! And with that, a very happy happy Valentine’s from us! Whether you’re a mother or not, that statement is a hard one to swallow. Because most of us know that the love we want to give to our children is far more than the love we give to ourselves. And it’s really no surprise. Because most of us have not been brought up to recognise the power and importance of self-love, even less so when we become parents. As mothers we are hard-wired to believe that to be a 'good' mother we should think only of our children. That we shouldn’t need to practice self-love, that we shouldn’t need anything more than the fulfilment of being a mother. Our families come first and our role as mother should be all the fulfilment we need. But that couldn't be further from the truth. A mother who doesn’t feed herself up on love and who doesn’t practice powerful self-care, isn’t some kind of dream mum. She is a mother on a short fuse, a mother who will get easily frustrated and secretly resentful at the demands of her family, a mother who will burn out on a regular basis and have little to give at the end of the day, to herself, her partner or even her kids. Neglecting her own needs so that she can focus on the needs of her children, sacrificing her own happiness so that she can be the ‘good’ mother, doesn’t work. What works is learning to love yourself. To take that delicious and abundant love that you pour into your children and turn it in on yourself too. Because a mother who looks after herself and her needs, who nourishes herself, who takes care of herself and who feeds herself with love, is a mother who is happy. And a mother who is happy, creates a happy and healthy home for the rest of her family. Self-love is this mother's power. She knows that when she is practicing self-love and self-care, she is filled up and has plenty of time and energy to give to her family. She knows that when she is taking care of her own needs she is much better at recognising and taking care of the needs of those she loves. And above all, she knows that when she is practicing self-love, she is showing her children how to do it too. And that is the greatest gift you can give to any child, because it is the key to a happy and fulfilled life. So practicing self-love and deep self-care when you are a mother, isn’t just a nice-to-have and it certainly isn’t self-indulgent. Quite the opposite. Learning to love yourself as a mother is the best thing you could possibly do for you and your family. So how do you do it? How do you learn to love yourself? Well, at Project Love, we get people started on what we call ‘Daily Acts of Love’: doing just one conscious, loving thing for yourself each day. It could be making sure you feed yourself with a nourishing breakfast as well as the kids, treating yourself to a soak in the bath at the end of the day, buying yourself a bunch of flowers. Just doing that one loving thing for yourself each day makes ALL the difference. Because with each act of love, you are giving yourself the message that ‘I matter, I care, I am loved’. And that alone can change everything. It really is that simple and that powerful. Which is why we have launched #28DaysofLove2016 - a free self-love campaign that gets you into the habit of doing one loving thing for yourself every day and discovering just what a difference it makes when you start to do that. It kicks off this Sunday and we want to invite mums everywhere to join in. So pop your email below, send this post around amongst the mamas that you know and let's start teaching our kids how self-loving is done! 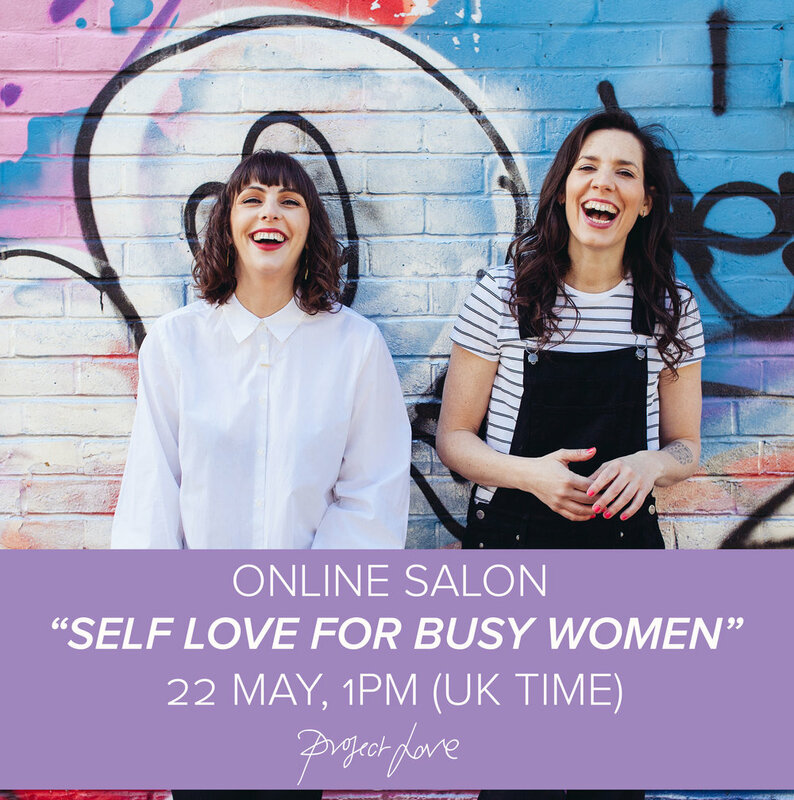 You can also grab your free Self Love for Busy Women audio workshop here. Join '28 Days of Love'. We are hijacking Valentine's Day with #28daysoflove2016 - JOIN IN! Waaaaaaah we are so excited! It’s almost Valentine’s Day and as ever we have hijacked it. And this time we have gone ALL OUT and created something really special for you all. #28DaysofLove2016 is our brand new online campaign designed to get you, and all the amazing women you know, hooked on self-love by discovering how simple and how powerful it really is. Because what we’ve found is that whilst we know that self-love is important, the challenge is knowing HOW the hell to do it. And that is what this campaign is all about. It will show you how to start exercising that self-love muscle so that it becomes a natural part of your day to day. It’s super simple to use and really fun to do. We genuinely cannot wait to do this course ourselves and we hope you’ll join us! All you have to do is pop your name below and you're ready to go! JOIN 28 DAYS OF LOVE! Turning Sunday into a day for simple pleasures. Simple pleasures are the little things in life that tend to have a timeless quality to them: buying fresh flowers, having breakfast in bed, a long soak in the bath, curling up on the sofa to read a book, baking a cake, a walk along the river, a yoga class, an afternoon of dancing around your living room to your favourite music...etc. Treating ourselves to regular simple pleasures is a great way to keep that self-love muscle in shape. And in the mad rush that life can so often become, making Sunday a day for simple pleasures literally has us stop and smell the roses. It brings us into the present, makes us grateful for the little things in life and has us make time for them. "Treated myself to a facial and cooked a fave dinner - I feel very content and grateful for life today"
"Added chocolate chips to my pancakes"
"Sat in a cafe for a couple of hours and browsed online potential vacation spots"
"Run with friends this morning and massage this afternoon"
"I just got in from panorama bar and danced on my own for hours! Loving it"
Take a little time out today and do something simple for yourself that gives you pleasure. And then come and let us know over on the Love Tribe (our gorgeous FB group) what you got up to. And let's get everyone making Sunday a day for simple pleasures.Spread the love by sharing the image above on instagram, twitter or FB (and share a link to this post) and let's get everyone into it. Let's make every Sunday a day for simple pleasures! P.S. The LOVE TRIBE is our private gang on FB where ladies like you gather to talk about love. If you're not yet a member, then just click here and ask to join and we'll welcome you in!